I’m still rolling my eyes in response to Disney’s latest fad – which is to produce live-action/CGI updates of their animated classics. They’ll say it’s for “a new generation” of viewers or justify it by claiming the approach provides “a new take”, but you and I are smart enough to know better. It’s purely a business decision, motivated by the gazillions that Tim Burton/Johnny Depp debacle “Alice in Wonderland“, earned at the box office. Granted, not all these live-action remakes have been as annoying and in-your-face as that CGI-heavy blockbuster (“Maleficent” was an interesting spinoff that worked), but none of them have offered anything wholly different or have proven themselves necessary – not even Jon Favreau’s “The Jungle Book”. In fact, it’s “barely” necessary. Granted, my rolling eyes is an initial response to these cash-grabs, I am still open to being proven wrong. I wouldn’t mind these movies working, but they need to be more than just nostalgia visits that play off familiarity. That sort of happened after watching last year’s “Cinderella”, a mostly good take on a familiar story from thespian director Kenneth Branagh (who helmed Marvel’s “Thor”). So, when it was announced that “Iron Man” director Favreau, an earnest crowd-pleasing filmmaker, was behind Disney’s live-action update of their 1967 musical adventure based on the work of Rudyard Kipling, I thought it was possible that this could be an enjoyable viewing experienced – again, depending on whether or not something different would be offered. 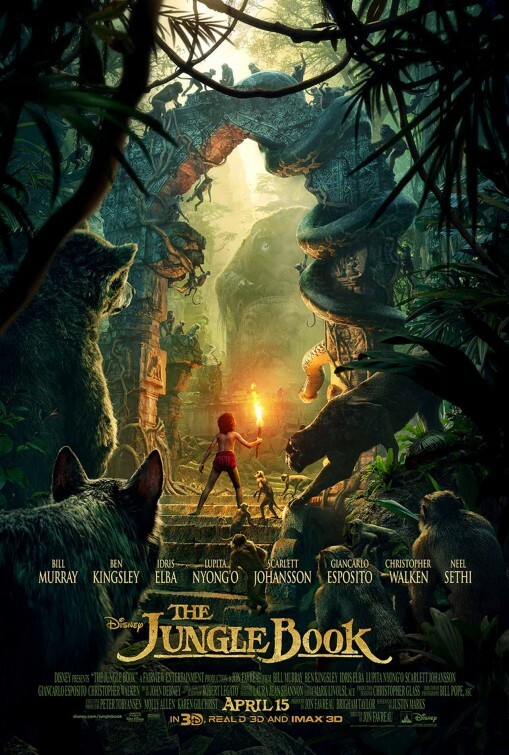 This version follows Mowgli (newcomer Neel Sethi), a boy found in the jungle by the black panther Bagheera (voiced by Ben Kingsley), who leaves him to be raised by a pack of wolves as a “man-cub”, led by Akela (Giancarlo Esposito) and mothered by Raksha (Lupita Nyong’o). While Mowgli grows up with the jungle as his playground, he receives a wake-up call when the malicious tiger, Shere Khan (Idris Elba), senses his presence and publicly threatens his life. Forced to flee the wolfpack, Mowgli is escorted by Bagheera, who knows leading Mowgli to the man village is the best way to keep him alive and safe. Along the way, Bagheera loses the boy, resulting in Mowgli encountering Kaa (Scarlett Johansson), a giant alluring python and is befriended by the wily and lovable bear, Baloo (Bill Murray), who requests the boy’s assistance in acquiring honey. After Bagheera catches up with Mowgli and Baloo, the man-cub is then carried away by the minions of gigantopithecus King Louie (Christopher Walken) and Mowgli must contend with the creature’s desire to know the secret of fire, aka “man’s red flower”. But an inevitable confrontation with Shere Khan awaits, finding Mowgli relying on his own resourcefulness and resolve to save himself and the jungle family he holds dear. 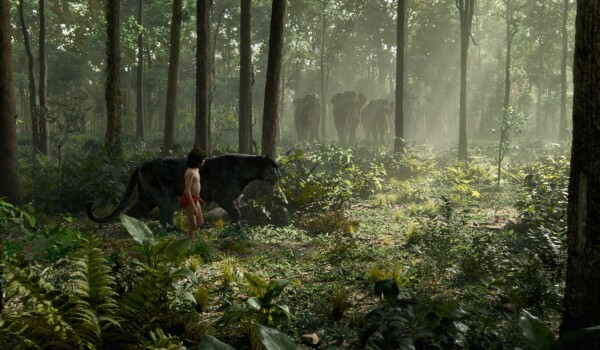 Favreau’s “Jungle Book” is beautifully to look at and impressively created with 100% digital creatures and environments, but there’s something missing in the feature. Both the characters and their surroundings feel stiff, fabricating and soulless. I thought I was kind of used to CGI creations, but there’s something about this movie that found it difficult for me to get them out of my mind while watching. As Mowgli, Neel Sethi is the only living/breathing actor with lines in the film, which is a problem since the kid is quite green. He’s got the physicality down, but his line delivery and believability is rough, so it doesn’t help that he’s acting alongside GCI creations. The talent behind those creations is quite impressive, however unless the characters they voice are moving, they come across as artificial. I just couldn’t help but think of how Baloo and Bagheera were man-made creations as I watched the movie and I doubt there’s anything Favreau could’ve done to rectify that. I really didn’t think I would be so jarred and distracted by the creatures on the screen and I found myself quite perplexed about it. After all, the 1967 animated feature is one of my favorite Disney movies. I grew up with it, loved all the music and consider it a classic. 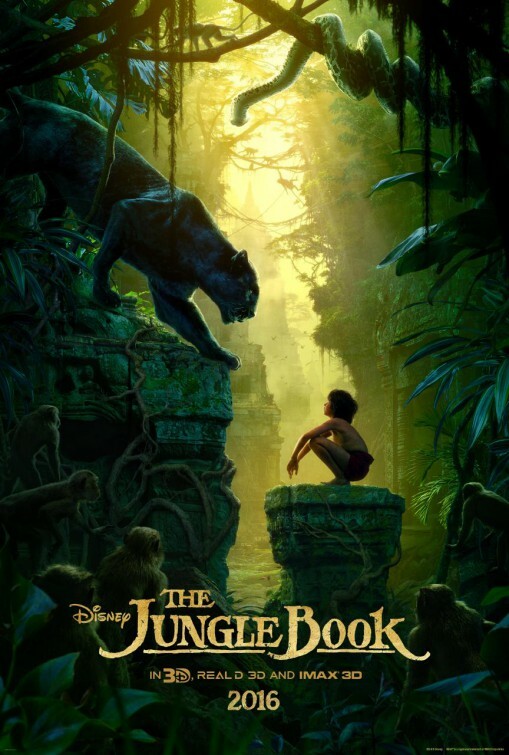 Walt Disney Pictures were more successful when they released their first attempt at creating a live-action version of Kipling’s tales in 1994 with Stephen Sommers’ “Rudyard Kipling’s The Jungle Book”, which starred Jason Scott Lee as an older Mowgli. Lee was surrounded by trained animals instead of CGI creations (the only man-made creature was Kaa and even then it was only part computer/part actual anaconda) and actors such as: Lena Headey, Sam Neil, Cary Elwes, John Cleese and Jason Flemyng. That film was shot on actual locations instead of the Los Angeles sound stages used by Favreau in this film. Disney’s 1994 release actually benefited from less technology – did they forget what worked or just forget they made that iteration? The screenplay by Justin Marks, who penned the forgotten “Street Fighter: The Legend of Chun-Li” in 2009, adds a bit more to Mowgli’s story his time around. He provides a backstory for the man-cub and even provides the boy with some handy skills – his animal pals call them “tricks”- but it’s really just the boy creating his own technology to make physical work easier. That angle gives Mowgli some engineering skills, instead of forcing a heroic template on the naive kid, which makes sense seeing as how everything else about the story follows the animated feature’s storyline. However, Marks also provides an element to the story that adds another dimension to the code of living the animals live by. This is seen when they experience extreme drought and the Peace Rock is introduced as a watering hole where all the animals can drink alongside each other in a respected truce. 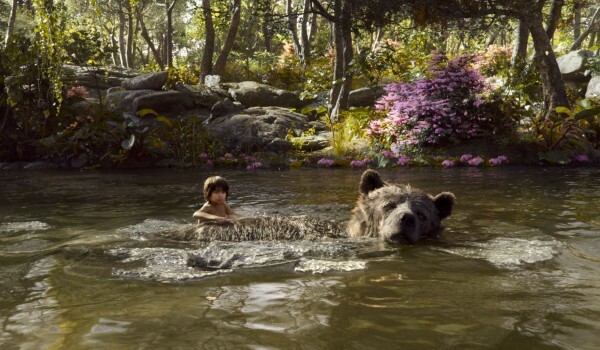 If Marks would’ve expanded on the details of animal life or spent more time with Mowgli’s relationship with the wolves, “The Jungle Book” could’ve offered a more unique take than what we’ve seen in past adaptations. Of the voice actors, there are standouts like Giancarlo, Nyong’o and Elba – there’s even some nice final work by the late Garry Shandling as a neurotic porcupine. But it turns out the larger-than-life presence of Murray and Walken (no strangers to voice work) are maybe too large, or bored, for their respective roles. Maybe it’s best if I didn’t know these two were voicing Baloo and King Louie and maybe if Phil Harris and Louie Prima hadn’t masterfully portrayed those characters, then I could’ve gotten on board with Murray and Walken’s work here. Maybe. They seemed to be dialing it in here. Murray invoked more life into the two Garfield movies than we hear in the lazy work he delivers here. On paper, the casting sounds great – Bill Murray playing the jovial, fun-loving bear who teaches Mowgli the “Bare Necessities” – but it feels like Murray could care less, instead of being care-free. Again, that could be due to the taxidermy feel the creatures exude, but Murray has a reputation for not given a crap about certain roles. Then there’s Walken, who portrays Louie as a giant mob boss. That doesn’t really fit with the manic and insecure characterization that worked so well on the diminutive orangutan Prima voiced. 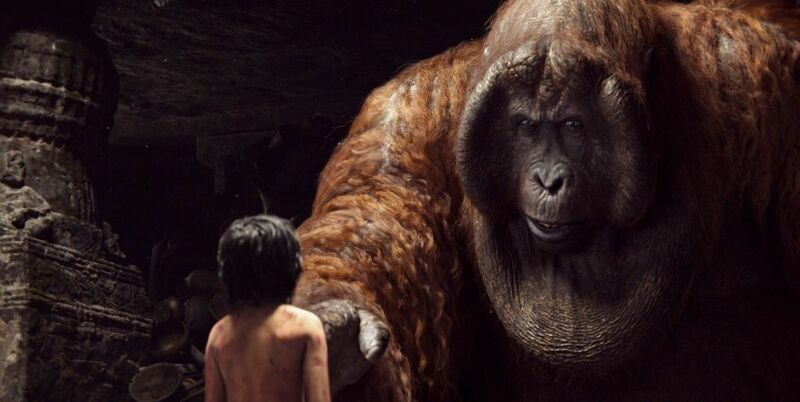 Come to think of it, the decision to make King Louie an gigantopithecus makes little sense and only serves to provide an ominous presence next to young Mowgli. I know that’s primarily a problem with the writing, but it doesn’t help me get on board with Walken’s work here. I get that it’s a different choice altogether and both versions have predominately the same character motivations, but Walken’s work as Louie felt as disinterested as Murray’s. Now, my problem with the portrayals of Baloo and King Louie could be the fact that I knew who would be voicing them before the movie started. I don’t usually find that problematic, but in this case I found myself looking at a CGI bear with Bill Murray’s voice coming out of it and, well, the same thing with King Louie. Maybe if I didn’t know who was voicing these characters I could get in to them more, but I wound up feeling the same way I felt when I heard Sean Connery’s voice coming out of a dragon – “hey, that’s Sean Connery”. I have a couple other problems with Favreau’s “Jungle Book” and it pertains to the sound and visuals of the movie. To be specific, the two songs used in the film, “Bare Necessities” and “I Wanna Be like You” – two gems from the Sherman Brothers which were used in the 1967 movie. Those jaunty tunes are sung (warbled/spoken?) by Murray and Walken, respectively, yet with the same lifeless energy they give to their lines. That’s a shame, but there’s something odd about even including those songs in a movie that has no other song moments. Disney’s animated version was undoubtedly a musical, whereas this is not – so why include only two songs (for the record, Scarlett Johansson’s version of “Trust in Me” – originally sung by the great Sterling Holloway – was saved for the end credits and I don’t know why) from the movie those songs are known? Now on to the visuals – this is a dark movie. Not in subject matter, but in the way it looks. This could be because I saw it in 3D – I was told it was an optimal format to see this movie (not quite) – and coincidentally any of the TV spots I see for this movie shows a bright and vibrant look. Where was that movie? So, the movie’s darkness may have something to do with the 3D aspect, but it could also be that much of the action takes place at night too. Whatever it is, most of the time it was a challenge to follow what was going on and who was saying what. Regardless, how I feel about this “Jungle Book”, it’s currently an undeniable hit at the box office (no surprise there) and a sequel has already been greenlit. Oddly enough, Warner Bros. is also producing an adaptation of Kipling’s “Jungle Book” stories, which will mark the directorial debut of motion-capture king, Andy Serkis, for a release in 2018. Now that sounds interesting. It seems, this “Jungle Book” wants to capitalize on familiarity and nostalgia and it wants to do its own thing as well. Unfortunately, it doesn’t really commit to one or the other very well.